Jesse Groemm (third from left) joins the Junior World Trophy Team on the medal stand after the Red Bull ISDE 6 Day competition in Germany. OCTOBER 1, 2012 UPDATE: After six grueling days, we are proud to announce Jessie and the Junior World Trophy team finished third in the International Competition! SEPTEMBER 26, 2012 UPDATE: After three days of competition, the NEAAC has learned Jesse and his Junior World Trophy team (pictured below) are currently ranked third in the international competition. Fore more information, please follow this link. Join us in wishing Team USA continued success in the remaining three days of competition! In 2012, Local Lodge No. 28 (Eastampton, NJ) Apprentice and American Motorcycle Association rider Jesse Groemm has finished in the top-ten of every AMA/Rekluse National Enduro round of the season. With such impressive stats, when Steward Baylor recently withdrew from this year’s International Red Bull Six Days Enduro, Groemm was named as his replacement rider for the USA. 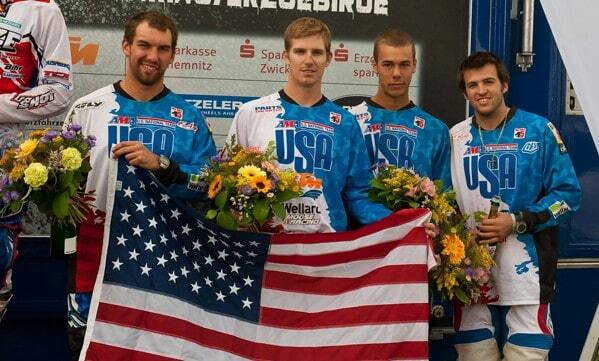 As such, Groemm will proudly represent the USA for the Enduro Team World Championship in Germany. During the Red Bull ISDE, the International Motorcycling Federation will host more than 480 riders – from over 30 counties – riding more than 1,400 km in Central and West Saxony. Over the course of six days approximately 300,000 spectators are anticipated to attend the scheduled events. There are three premier teams representing the USA at the ISDE. Groemm is one of four riders comprising the Junior Trophy Team – which fields four riders younger than 23 years old, competing in a minimum of two classes. For more information on Apprentice Groemm, please take a moment to read this July 5, 2012 interview that Apprentice Groemm conducted with the Digital Offroad website. Please join the Boilermakers Northeast Area Apprenticeship Committee in wishing Apprentice Groemm well in his exploits; interested individuals can follow his ISDE progress here.